EZ High MW Tissue DNA Isolation Kit is for isolating high molecular weight, archive-quality genomic DNA from solid tissues. The kit utilizes a solution based salting-out precipitation method for purification of DNA. The tissues are digested with Proteinase K in Nuclei Lysis Solution. RNA is removed by treatment of RNaseA. Other contaminants such as proteins are removed by salt precipitation. The DNA is recovered by precipitation with alcohol and dissolved in DNA Hydration Solution. The kit can process a total of 4 gram solid tissue. The purified DNA is ready for a variety of applications including restriction digestion, amplification, sequencing and membrane hybridization (Southern and dot blots). 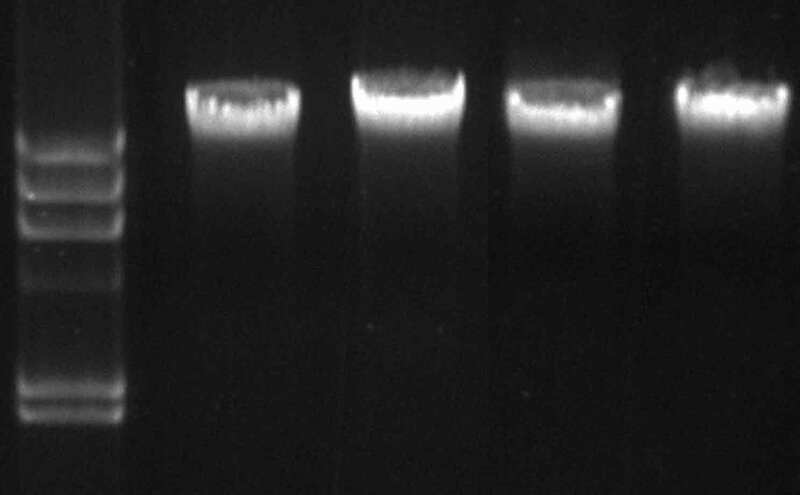 Genomic DNA isolated from different tissues using EZ High MW Tissue DNA Isolation Kit were analyzed on 1% agarose gel. M: Lambda-HindIII Ladder.